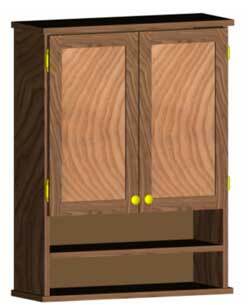 A simpler variation of our classic wall vanity design, this cabinet incorporates a "Cape Cod" look. It consists of storage shelves hidden behind simple flat panel doors and an opened shelf storage area underneath. The construction incorporates solid hardwood and veneer. It is fairly easy to build for the beginner, using simple tools and joinery techniques. Finish used for this project: water-based Flecto Varathane Diamond Wood Finish, in a satin sheen over Minwax Wood Finish (stain), Special Walnut #224.